Descriptive DVDs and VHS videocasstttes are available to blind and visually impaired TBS patrons. Patrons may check out up to two DVDs and four videocassettes at a time. Videos are charged out for one week. Click the "Descriptive Videos" link under Search the Collection in the left column of this page to see what's available. 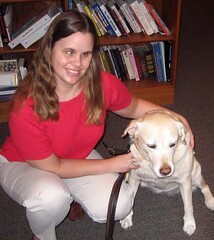 Columbia resident Carmella Broome, author of Carmella's Quest: Taking on College Sight Unseen, published by Red Letter Press, is the 2011 recipient of the Ned E.
Ms. Broome is a local author and a longtime member of the Talking Books Services. She is the author of Carmella's Quest: Taking on College Sight Unseen . Read more about Congratulations to Carmella Broome! Voice on the Go Is a mobile application that uses your voice to email, text, or call contacts. It can be used with a variety of devices including iPhone, Android, and Blackberry. TBS and the State Library will be closed July 4th for the observance of independence Day. Every day for 100 days, five different organizations will compete for the most votes with the daily winners being awarded a new Toyota. The Bureau of Engraving and Printing (BEP) has developed a free downloadable application (app) to assist people who are visually impaired identify the denomination of US currency.